Title Series: Kore wa Zombie Desu ka? The omnipotent girl who acts as the center of the universe. Unlike what her reputation suggests, Eucliwood, who prefers to shorten her name to 'Eu', does not dwell in a mysterious vortex of power somewhere in the tenth dimension. She can be more commonly found sitting outside a nearby convenience store. If one does not mind her universe-bending powers, there should be no harm in inviting her in for dinner. 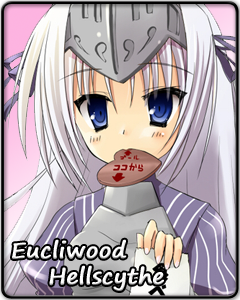 Eucliwood is a girl of few words and a hefty appetite. It might be difficult to get a proper conversation going with her, but she is certain to remind her caretaker about food. Eu seems like a pretty pet just asking to be hugged, but she can get demanding or lash out in self-defense. Like some cats, she considers herself the master of any household she enters. For added amusement, Eu's caretaker can also try to break her poker face. Eu has been reported to show signs of a smile when exposed to particularly ridiculous sights. Although the chances of success are low, it is said that something special happens when Eu shows emotion. Is it something good, or something bad? You never know until you try.